What if I told you that more people were using Google search than ever before. Now, what if I told you that searchers are also clicking on less organic results than ever before. It almost doesn’t seem possible, right? Yet, both of these statements are true. Google search is experiencing an all-time low in organic CTR (click through rate); meaning that searchers are less likely to click on organic query results than ever before. But why? Well, Google has introduced a lot of recent changes to their SERP (search engine results page). This has led to a reduction in the number of clicks available to organic results. Things like Knowledge Graph, the news carousel, images, shopping, and improved AdWords features have taken a real bite out of organic CTR for most high-volume keywords. 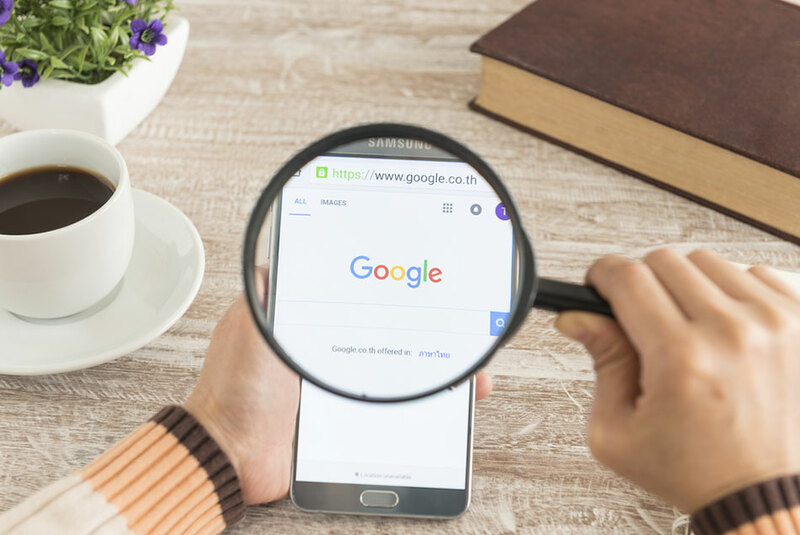 While this information might be scary to some publishers, understanding this data can actually open the door for some pretty exciting new opportunities to acquire Google search traffic. Below, I’ll highlight an expert-level hack for increasing organic CTR and increasing the amount of traffic you bring to your website for all of your underperforming keywords. Getting your content to rank in a meaningful way in Google search requires time and effort. Sure, some keywords can rank well overnight, but the ones that bring heavy traffic volume usually take a lot of waiting and tweaking. Unfortunately, if that wasn’t enough, those once extremely fruitful efforts that rewarded tons of patients are now getting less and less valuable. What do I mean? Check out the organic CTR for this keyword below. This keyword is for one of my favorite rappers. It is a dynamite keyword with a very high monthly volume. Unfortunately, less than HALF of that volume goes to websites that organically rank for the keyword. What’s more, page 1 organic results for that keyword are likely soaking up roughly 90% of that 41% according to often-cited research from Advanced Web Ranking. Ugh, that treasure trove of traffic is dwindling quickly. This is pretty disappointing for most digital publishers. In the past, it wasn’t uncommon to see popular keywords with an organic CTR in excess of 85-90%. But now, search results are starting to look much different than they used to. While many publishers may still be searching and looking at their sites on desktops, odds are that your visitors are on mobile devices. And, mobile visitors are browsing differently and Google is adjusting by delivering results that often put organic web results on the backburner. Check out how long it takes to actually get to an organic website result on a mobile device for this keyword. No matter where you rank organically for a keyword, you’d never get 100% of the traffic, but with modern mobile changes, you’re likely getting less than ever before. These same studies are beginning to suggest that even long-tail keywords are experiencing the same fate. These risks are compounded by the fact that Google updates their algorithm 500-600 times per year. That’s more than once a day. Which also doesn’t even account for the fact that they are always testing new rich snippets, carousels, AdWord changes, and other rich media results. These things all massively affect the total volume of search traffic that actually goes to organic websites. Google ads get a lot of the blame for this drop in CTR, but ads have actually been around for a long time. Most of the studies tend to show that the ads mainly affect the number 1 and 2 results but have little effect on the rest. It’s these other SERP changes Google has implemented that are affecting things most dramatically. Even if you have successfully attacked many of the rich snippets available to your site, it’s possible your organic CTR is still in decline given the current climate. And lastly, if you’re site is like most publisher sites, your keywords are likely unbranded (meaning not associated with a brands keyword like, “Pepsi”). This means your CTR is actually even lower than many of the averages commonly suggest. So, as an online publisher, how do you mitigate the risks of these changes? How do you prevent a loss of traffic, or better yet, how do you use this trend to favor your website? 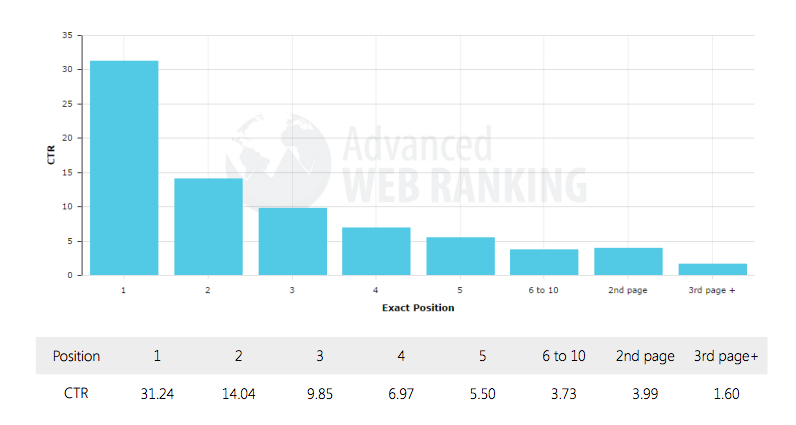 Essentially you want to increase the CTR of your top 10 ranking content. This brings you, even more, traffic without worrying about moving up or down a few spots along the way. What’s more, affecting this is likely to move you up a few spots as well. The mechanism behind that change is actually more important than the rankings change itself. The improved CTR by itself offers just as much benefit (if not MORE) than improving the ranking. I’M ASSUMING PUBLISHERS CARE MORE ABOUT TRAFFIC FROM SERPs THAN ACTUAL RANKINGS, RIGHT? At the end of the day, if the increased CTR and organic traffic to your site’s page lead to an increase in SERP positioning, that is just icing on the cake. How do you improve organic CTR? So, how do you do it? Start with your title tag and meta description. Working to improve these elements is very low risk. As long as you don’t destroy your CTR in the process of improving these, you won’t risk your site’s ranking. The goal of improving these should be to get searchers to click on your results instead of all the other ones on the page. This means you have to stand out. But, wait! You don’t want to mess up a title and meta that are already outperforming many others do you? Also, you don’t want to create some form of clickbait that will tank your UX metrics either (i.e. a bunch of unrelated traffic that bounces). Before you hop into your Yoast plugin or HTML code base to begin changing up your meta descriptions and title tags, let me show you how to take a data-driven approach to this process. Don’t be like all of those other content marketing and SEO “experts” out there trying to guess your way to more traffic! The data is right here in front of us and we can use it to ensure better results. GOOD NEWS: This is all made easier inside of the New Google Search Console. See how to automatically do the calculations below here. Fortunately, Google provides us with a free solution to our problem here. Google’s Search Console is filled with the data we need. It includes search impression data, CTR info, and search query volume. To find which pieces of content are likely to benefit the most from testing and optimization, head on over to Google Search Console. Click on Search Traffic > Search Analytics, then select to show clicks, impressions, and position, and download all of the data. Now, it’s spreadsheet time. Create a spreadsheet and export all of your existing top 40 keywords onto it (you could do this with SEMRush or Moz — if you’re using Ezoic ask your account manager for the list). 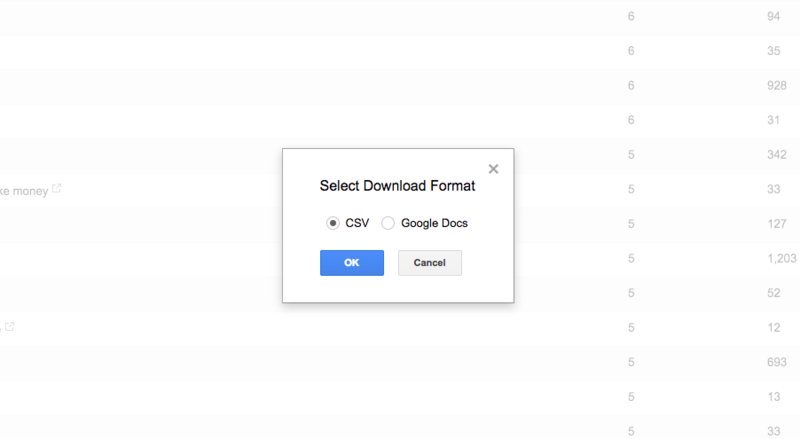 Now, once you’ve exported your keywords and queries, match them up on your spreadsheet. 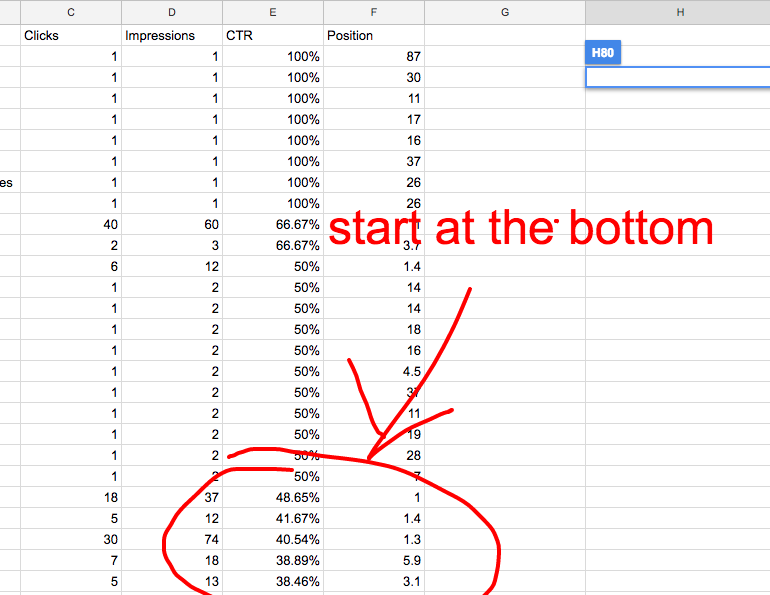 Now, you can total the CTR for all your impressions and clicks for a certain keyword based on all the unique queries. This will allow you to rank all of your content ranking in the top 40 results by CTR; providing the knowledge of which pieces of content are performing the best already in SERPs! You can also skip the part about matching keywords and queries; however, the most dynamic and accurate way to make these decisions is to marry all of this up. You could potentially work off of just the downloaded Search Console data it just won’t be quite as dynamic. Now, we can take a data-driven approach to improving our organic CTR (and driving more Google search traffic to our properties). The best place to start is on the lowest performing content. Take a look at those CTRs and focus on modifying the post titles and metas to enhance organic CTR. 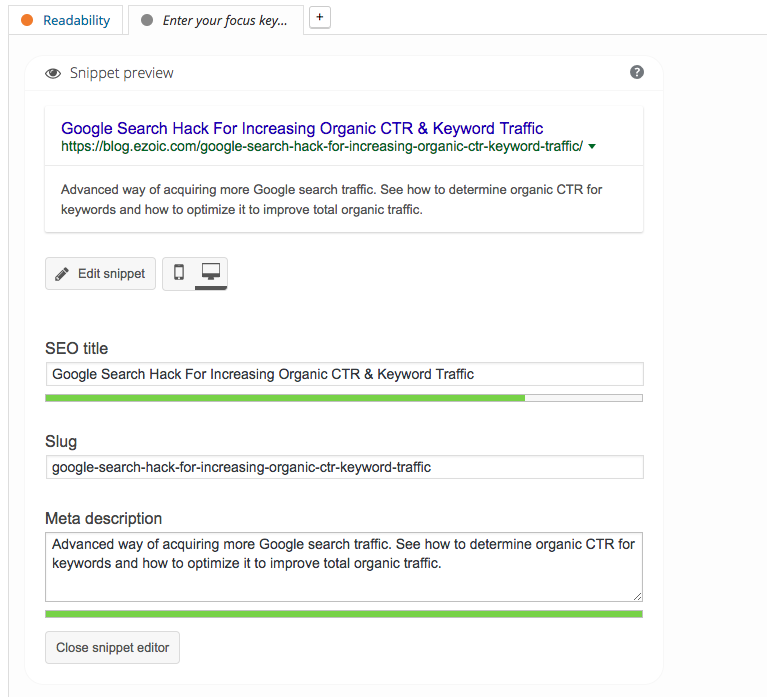 Once you’ve made title or meta changes, make sure to have Google recrawl the content (Search Console Fetch as Google – see below) so that the results will appear quickly in SERPs. After about 20-30 days you should be able to redraw your reports and see how the changes are affecting CTR. Obviously, you want every change you make to positively affect your CTR. One of the best ways to do this is to look at at the other page results that are above yours. Sometimes you may be leaving out critical words or info that in your title or meta that searchers might be looking for. Additionally, you should look at similar queries and see what top results look like as well. Media outlets like Mashable, Complex, and Deadspin do a great job of providing attention-grabbing material that isn’t too-clickbaity. It’s worth looking at results that these outlets churn out; as I find that I can duplicate a lot of their premises to increase my chances of success. There you go. To increase your search volume for your current keywords, focus on hacking your organic CTR. This offers both ranking and traffic benefits. It will help you mitigate against search trend changes and will also help you grow your site. Questions, thoughts, concerns? Leave them below and I’ll chime in with advice. Fantastic article. It is too often than we, SEOs, forget about traffic and focus only on rankings. At the end of the day, one fills our pockets and the others fills our egos. This guide helped me a lot to learn more about SEO , Driving the right traffic to my website , and much more , thanks very much ! Thanks for sharing this information. The tips given in this article are very much useful for getting more organic traffic. Wonderful article and good information about ctr keyword traffic.